The lone survivor, it’s a theme that has cultivated numerous stories in film history. This character can serve numerous points of narrative purpose - a protector, a hired hand, or an explorer are just a few of the designs. Director Jason Trost applies this character type to the science fiction, horror influenced, film “How To Save Us”. With desolate landscapes that help assist with the lonely and despaired atmosphere, Trost crafts a genre film that feels much bigger than it actually is. 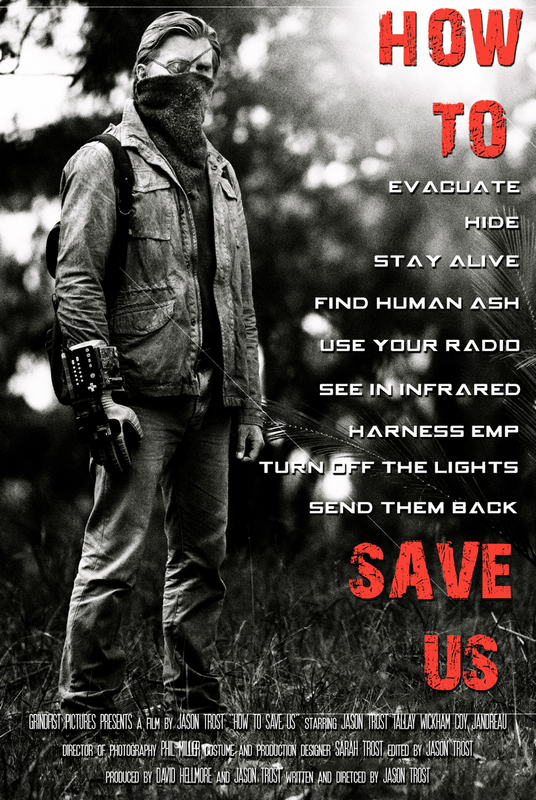 While the story is slow moving throughout, the ideas don’t reflect the simplistic structure but instead are ingenious and creative, making “How To Save Us” seem tailored for a midnight movie offering. Brian’s (Jason Trost) brother Sam (Coy Jandreau) goes missing in Tasmania during a strange quarantine that leaves the entire region deserted. Brian promises his sister that he will bring Sam home safety. Taking the place of the island inhabitants is a mass of electromagnetic ghosts, who can only be hid from by spreading the ashes of the dead over the entire body. Brian makes the journey into Tasmania, hiding from the roaming dead while being one step behind Sam who is leaving clues meant to help protect mankind. It would seem very tedious to watch a lone character walk from place to place, looking at the remains of an empty world without so much as a whisper of dialogue. But Trost creates a compelling storyline that functions like a crime mystery, with one character uncovering clues and following them from one place to another. The viewer understands the world that is being portrayed but isn’t exactly sure why or how the dead have returned or where the inhabitants of the island have gone. It’s a good technique to keep the slowly paced film from becoming too monotonous. Still, there are many moments when the film lingers with the progression of the characters and plot, it becomes repetitious and pulls attention away from the nicely established narrative beats. Jason Trost has a good screen presence and throughout the film is the most interesting character. Trost takes on triple duty, playing the role of director, writer, and actor. Trost as a writer implements some really ingenious and effective designs throughout the film, one being the use of human ash as one of the rules of protection. This simple use of grey makeup makes the living resemble some kind of rudimentary zombie design, it's a great contrast to the electrical apparitions. As a director, Trost guides the film; confidently creating a world that conveys an atmosphere of dread and loneliness. As an actor, Trost does a decent enough job but may have been best suited finding an actor that he could have directed towards the themes he was trying to communicate. “How To Save Us” is ambitious; a film that crafts an immense world with two actors and some very creative filmmaking strategies. The narrative has some pacing issues but makes the most of the attributes that distinguish the genres Trost is exploring, which keeps the film interesting throughout. I am curious to see what story the capable director decides to tell next.